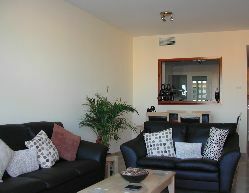 New luxury apartment - with golf & mountain views close to marina & beach. Luxury 2 bedroom / 2 bathroom apartment situated in the beautifully landscaped gardens of Duquesa Village, only 30 minutes drive from Marbella, Puerto Banus / Gibraltar and 60 min from Malaga. The apartment is fully furnished to a very high standard with hot and cold air conditioning, marble floors throughout and secure private garage parking space. There is a fully equipped kitchen with top quality appliances. Only a few minutes from the beaches and Duquesa marina where there are a variety of excellent bars, cafes and restaurants. Duquesa golf club is only 2 minutes away, with a further 12 courses including Valderrama and Sotogrande within 30 minutes drive. 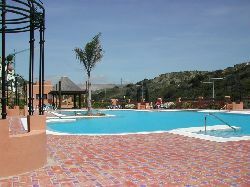 A non-refundable deposit of 25% is required at the time of booking. The balance will be due 6 weeks prior to arrival. A security deposit of �200 on a separate cheque will also be required with the balance which will be returned to you uncashed on your return home unless there is any damage. The rates include all linen and towels and cleaning of apartment when vacated. For a small charge we can provide a welcome pack on arrival. We are also happy to accept payment in Euros. Minimum stay for may to october is 1 week.